Pioneers in the industry, we offer rope pulley from India. We have gathered a huge customer base in this domain by presenting a comprehensive range of Rope Pulley. 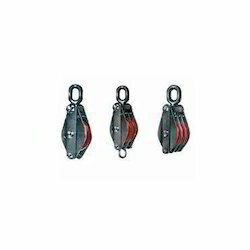 This pulley is developed and designed adhering to industry standards. Our professionals have manufactured the pulley using quality materials and OEM parts. In addition, the pulley is made of using advanced technology and innovative techniques to provide it an accurate and aligned performance. Clients can opt for custom designs according to their business requirements. Apart from it, clients can also get the pulley made available to them at industry leading prices.